So, what does a Game Master actually do? Let us be the first to tell you, it is not as easy as it sounds. At first glance, being a Game Master seems like a lot of sitting around and watching a screen. Sure, that is a large part of it, but there is oh-so-much more! What is this ‘more’ you ask? Well, take a look below to see the characteristics needed to make up a top-notch Game Master! Attention to detail is a very valuable skill to have when working in an escape room. This might come as a surprise, but the cameras in our game rooms are not extremely high-definition. Our best Game Masters are able to keep track of the smallest of clues even in the dimmest of light. Attention to detail also comes into play in game design and maintenance. Escape rooms are meant to be immersive, so every last inch of the space must be utilized and relevant. In the upkeep of the room, cleaning should be meticulous. After all, thousands of people have come and gone through those games and the rooms need to be as clean and as functional for game #1,698 as they were for game #1. Listening skills are equally important while watching a game. Maybe you glanced away from your screen for a second and when you look back over your team is working on something entirely different. Did they solve the previous puzzle? Did they table it for later? Are they discussing what their favorite colors are in elaborate detail? With careful listening, it is very easy to understand a team’s process and point in a game or puzzle. Listening skills are also an integral part of good customer service. If a problem is being brought to a Game Master’s attention by a guest, it’s essential to be able to listen to them to really understand their experience and how the issue can be prevented in the future. This provides excellent opportunities for constant improvement and makes the escape room experience better for everyone. Problem-solving under pressure is probably the most difficult trait to become proficient in. Any number of things can take an unexpected turn in an escape room and it’s important to be able to think calmly and act quickly. Be it technology failure, destruction in the room, or conflicts between guests, acting quickly and efficiently are necessary for resolving these issues. As you can tell, most of what being a good Game Master comes down to is ensuring that our guests have the absolute best experience that we can offer. It sometimes can get pretty hectic but we wouldn’t want it any other way. 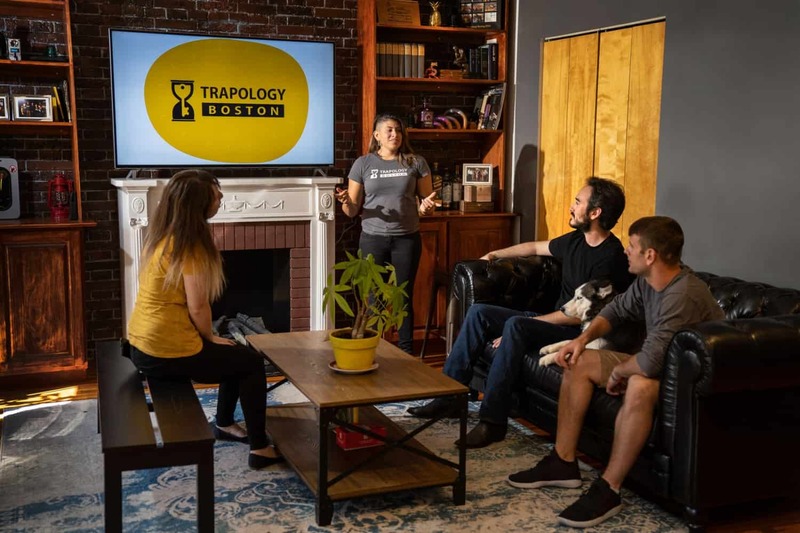 Come in to play a game with us and get to know some of the wonderful staff that keep Trapology running like the well-oiled machine that it is. And if the title ‘Game Master’ has a nice ring to it and the above traits scarily match some of your own, maybe make a quick search for ‘Trapology’ on your favorite job postings website. We’re frequently looking for new members of the Trapology team and would love to hear why you think you’re a good fit!